I forgot to tell you on thing. Back in early December, I wrote a cauliflower recipe for the Boston Globe. 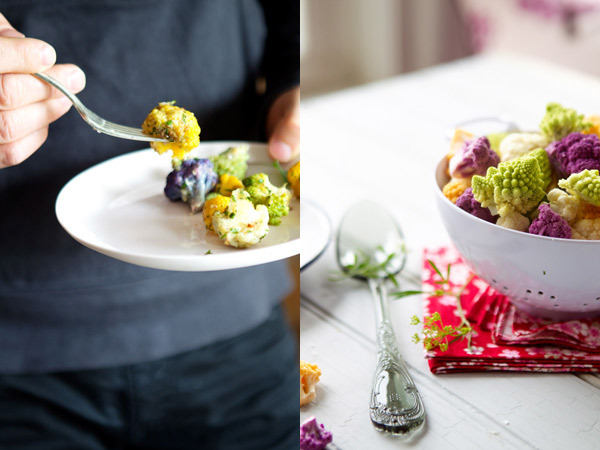 I had found beautifully colored varieties of cauliflower at the market and I fell in love. I bought more than I needed, but I yet knew I would find home to these jewels. They are irresistible, even when you don’t care much for cauliflower. Because I am French, the idea of a gratin came naturally to me. So I prepared a cauliflower gratin. A light one. One where the vegetables are topped with a mixture of fresh herbs, ground nuts, crème fraiche (of course! ), grated cheese and garlic. One that lets the vegetable breathe and lead the dance. I simply love this recipe. I hope you do too. The recipe was published on December 28, and I simply missed to let you know…. I also have a girl named Lou-Lou. Absolutely amazing colours! I’d eat that gratin just for its looks even though I highly dislike cooked cauliflower. Beautiful! That gratin looks so appetizing. I really love all those colors. The first picture is exceptional. Wow, all these beautiful colours! probably makes people eat cauliflower who’d usually dislike it. Oh my, those colors are outstanding!!! The photos are breathtaking!! Gorgeous! I love cauliflower gratin! It is nice to have a lighter option! Yes, really beautiful, the colors. Last Sunday I sliced a whole head of cauliflower and then roasted it in the oven with olive oil and sea salt, so good. An underrated vegetable for sure. I do love cauliflower but don’t have enough creative ideas for how to serve it. This one is a bookmarker. Thankyou! Oooh, I’m going to try this over the weekend. All my wintertime veggie dishes either involve a soup or a gratin, so this is right up my ally. Absolutely lovely! Can’t wait to try this one out! Those are beautiful colors of cauliflower! I had cauliflower so fresh from the farm (where I worked) that the taste almost made your tongue sort of tingly-numb. It is what I have come to expect from raw cauliflower. Gorgeous pictures. And look at all those different colors! First, I love the colors. Second, I love that this recipe is made with 3/4 cup grated Manchego. YUM! YUM! I feel calm and serene when looking at your photos. just that first photo…wow. absolutely gorgeous. everything else, too, but that first one took my breath away. I have never seen cauliflower that is any colour other than white. Your photos do them justice. Stunning. I’ve never seen a prettier gratin! I have lots of cauliflower from my CSA box. i will most certainly try this. I love multicoloured cauliflower. I’ve spotted some at the store near my house. 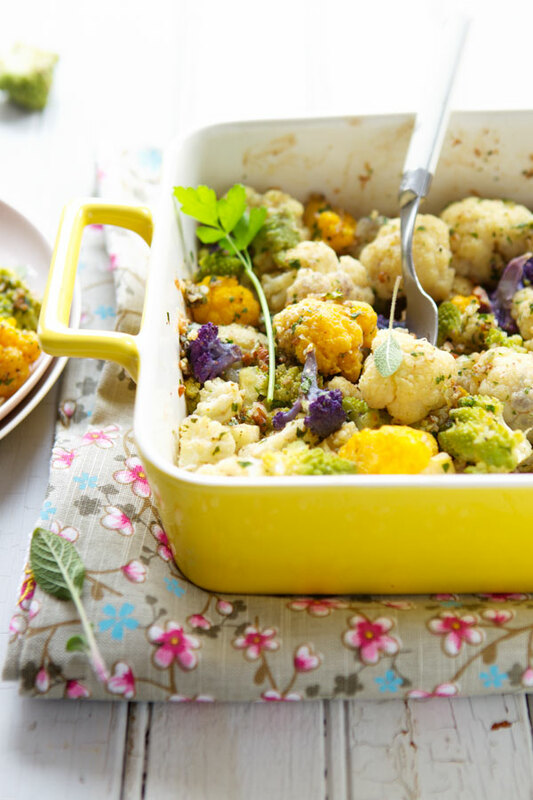 I think this gratin is the perfect “excuse” for buying some beautiful cauliflower. Thanks for the recipe and your images are gorgeous! I love your pictures! 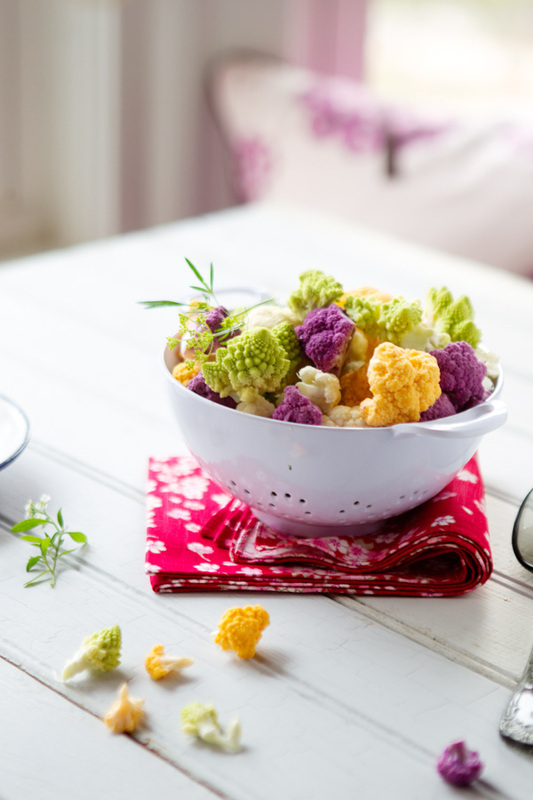 I’ve never seen this cauliflower colors… so beatiful. I’m reading your blog on my smartphone device! 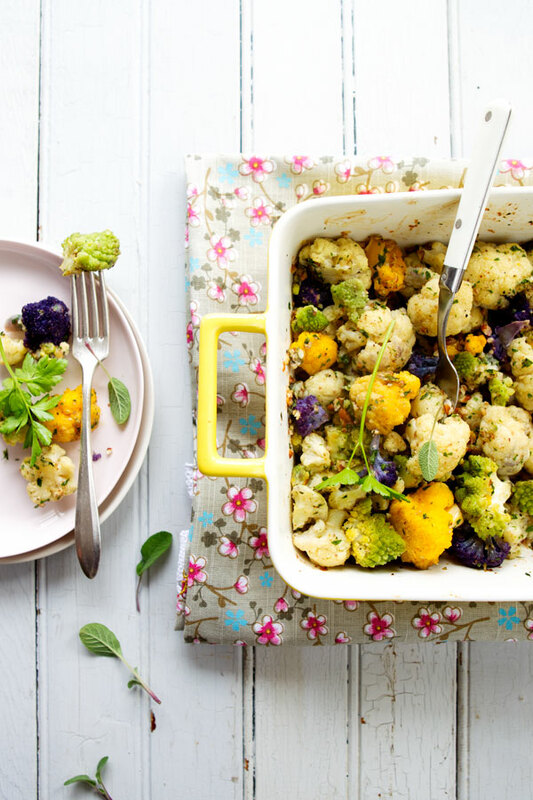 Glad to know that your blog is phone-friendly 🙂 love the multi-coloured cauliflower! We always have these in my local market. Gorgeous colours! Über cauliflower informiere ich mich regelmäßig. Danke also für deinen Blogpost zum Thema. Vielen Dank dafür, Ann-Christin.